Chickmagalur, the South Indian hill station is adored by many. It’s famous around the world for its dense coffee plantations and popularly known as the “Coffee Land of Karnataka“. The coffee-lovers should not miss the fact that the first coffee crop was grown in the Baba Budan Giri in the hills of Chikmagalur. We have a special love towards this place for introducing us to one of the favorites of each day, a deliciously brewed cup of coffee. Though the climate here is pleasant throughout the year, the aroma of the plantations and the greenery of the place is more comforting during and after the monsoons. 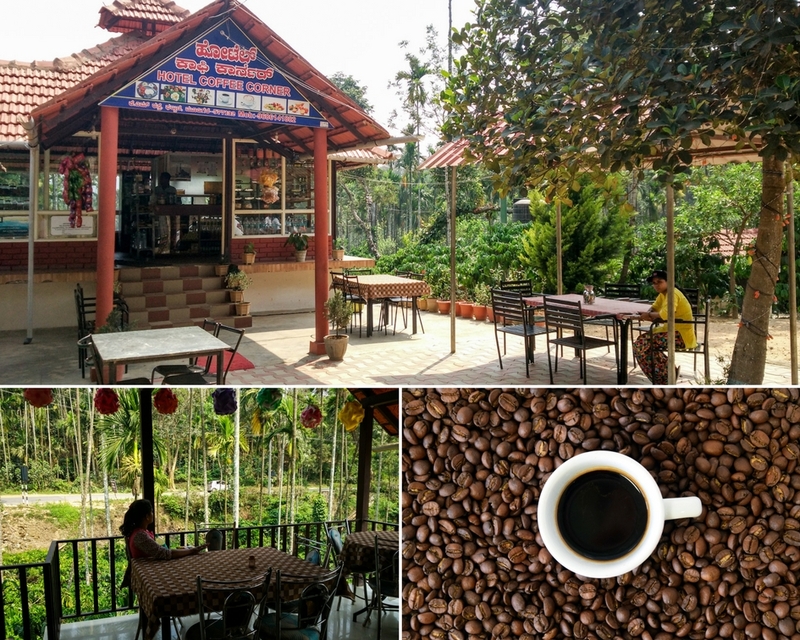 As we could not stay disconnected with the Coffee Land for long, we planned to be there in the month of April before we could get back there again during the monsoons. However, known as one of the traveler’s paradises, Chickmagalur cheered us in an unanticipated way. Nature’s store had a lot to offer to us. We drove from Bangalore and as we reached the Chickmagalur hills the roads became shady. The weather turned very cool with light filtering lazily through the tall trees. The chinking and chirping sounds of the birds were very sweet during the calm ride. Soon we reached a place called Midadi and our lovely memories associated with this place came up unfaded. It was during the month of October, a few years back when we visited Midadi for the first time. Unaware of the place and its map, we lost our way in its valleys. Soon our driver was tensed after realizing that we were running out of fuel but it didn’t bother us as the place we were stuck at was a heaven. Midadi is amazingly beautiful with the palms and coffee plantations, water streams and falls appearing every half a mile, and its breath-taking viewpoints. The stacked thick green hills – View from a point we trekked to. Soon we reached our place of stay, The Kanive homestay. Adjoining the beautiful valley formed between Ballalarayanadurga and Kuduremukha ranges, this place stands out on a hill. A two-minute walk from the homestay takes you to the view point-come-network point. This point offers the best view of the Ghatikallu hill. It’s secluded and one of its kind the Chickmagalur hills. Our stay and activities here were very much rejuvenating. Numerous waterfalls, trekking trails, fragrant coffee plantations, picturesque tea estates, wonderful view points, the beautiful Bhadra river, and of course the peaceful and laid-back lifestyle in the hills almost summarizes the answer to why Chickmagalur is so magnetic. We had our share of joy drenching in the waters, trekking across hills and relishing home-made flavors of Chikmagalur cuisines. Chickmagalur never disappoints any of its guests even in the summer. Mornings and nights were cold with the vast blankets of fog hung heavy over the hills. The sight of swooping clouds was unforgettable. Waking up to bird sounds, the peace of mornings was soul soothing. The days started with a warm hug of the delicious cup of coffee. While at The Kanive, we found ourselves leisurely walking and crossing every small hill and valley in the vicinity. When we were rejoicing our stroll through the pulpy smelling forests in silence, the only sounds we could hear were the creaking branches of aging trees, the shrill noises of crickets, and the twigs crunching under our feet. We reached a hilltop and spotted our homestay amidst the thick green carpets. If it was post-monsoons, we would have enjoyed the thick tall grass in the meadows atop the hills. After having the cold bite of winds and pleasing sights of fog-tinted mountains, we walked down as the sun rose up high. The huts with smoking chimneys in the paddy fields along our way down were like inviting us to get there to breakfast. However, we returned to our stay and started off to reach a nearby waterfall after the morning meal. The waterfall was not heavy and it was drizzling into the rocks. We went down to get a natural massage under the water falling through the strong roots of giant trees. It was a freezing bliss-pool at the bottom and we were shaking with the cold. As we got back to the homestay, the hot lunch was Godlike after our moment of madness. Time just flew and the evening turned much colder. Warmth flooded the place as we sat around when the campfire came alive. During this visit, we encountered a new place our way back from Chikmagalur, Hotel Coffee Corner in Mudigere where we stopped for lunch. Our meal at this place which was surrounded by many palms was very fulfilling and unforgettable. Even though we visit Chickmagalur very often these three wonderful days in the hills and plantations went into becoming another chapter of our most memorable travels. There are many beautiful homestays and resorts in Chickmagalur. This lovely place attracts everyone. The famous Kemmanagundi and Kuduremukha treks are favorite for many. The Kalhatti, Hebbe, Hanumanagundi waterfalls are very well-known. No wonder that this place which is easily reachable with so much to offer is always the first weekend getaway to many put up in Bangalore. Sadly we found this place more trashed and littered. The pleasant evenings are turned into the noisy disco and party lands. In recent times, due to the huge crowd pouring in from the cities, a major revenue is from the tourism. Hence the local people who are running the resorts or homestays take extreme care to make their visitors happy by providing them with whatever is asked for. Let us put our sincere efforts to preserve its tranquility and flawless beauty. Let us be the responsible bunch of travelers reaching to this place for relaxation rather than entertainment and pleasure. I’m a bigtime coffee addict and I guess Chikmangalur is a must visit for me! Indeed homestays are the best way to enjoy such a place! Its more like a relaxing way to enjoy the place than a active holiday! Hotel coffee corner looks perfect! To be sitting there, enjoy that view and have a meal would be just awesome!!! When I think of India, I think of tea, I had no idea about the coffee plantations there. The view from your trek is stunning, I’d love to see it during monsoon season too. The Kanive homestay sounds perfect for visiting Chickmagalur, the location seems to be convenient to all the area has to offer. Coffee Land of Karnataka sounds like a dream destination for coffee lovers. I can imagine that the place must be so fragrant. I would like to see the pretty flowers from a coffee plant. I did not expect that the homestays have a lot of trash. The owners and tourists should be more proactive in maintaining the beauty of the surroundings. This homestay is my kind of place to stay. I love being close to nature and you seem to have done a lot of nature exploration during your stay. The fact that you can enjoy an overlooking view is a bonus! I love coffee, and nothing beats fresh roasted beans. What a lovely place to explore and drink coffee. Hotel coffee corner sounds like my kind of place! I didn’t know coffee is also famous in India. I would love to visit this place, and homestay is totally my type. I will not miss this Coffee Land if I visit India. Lush green and beautiful … awesome to trek! It’s a pity people turn resorts into a disco at night … wonder if they would enjoy natures sounds more. Seems like a great summer getaway! I’ve never heard of Chickmagalur before, but I learned so much about it from your post! Mmm, coffee. I would love to capture the morning fog in the mountains. Seems like you had a great homestay experience! I am inspired by your post to visit this picturesque place! Great job! Nice post and pictures would love to visit this place.